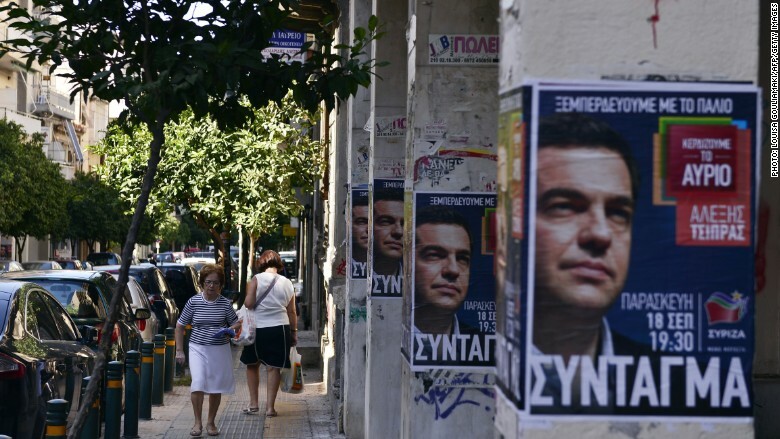 Will yet another Greek vote spark new debt crisis? Greeks are heading to the polls Sunday, for the third time this year. And once again, Europe is holding its breath. The election result is too close to call and neither of the main parties -- left-wing Syriza and conservative New Democracy -- are likely to win a clear majority in parliament. Both are committed to reforms Greece needs to implement in order to receive more bailout cash promised by European countries in July. So everything's fine, then? Not quite. Greece needs a government to deal with its economic crisis, keep the bailout on track, and cope with the challenge of thousands of refugees flocking to its shores. An inconclusive election result could mean delay in forming a coalition, or worse, yet another election. Unless a new government gets to work quickly, Greece risks being unable to get more money from Europe. That would leave it unable to pay 3.2 billion euros ($3.8 billion) it owes to the International Monetary Fund later this year. "Greece is not sustainable and the big issues are how far the program will go off track and how many eurozone members will join Germany in viewing missed targets as no longer a price worth paying," said Gabriel Sterne, the head of global macro research at Oxford Economics. The rescue agreed in July with Europe, worth up to 86 billion euros ($97 billion), prevented financial collapse and kept Greece in the euro. But the IMF says Greece desperately needs "substantial" debt relief. Without it, the country may once again find itself unable to pay its bills in the long term. Europe has been unwilling to talk about that, saying the first review of Greece's economic reforms must come first. The longer that is delayed, the greater the pressure on Greek finances. All the while, the Greek economy sinks deeper into the mire. "We've seen a big drop in economic sentiment, we've seen big drops in imports and exports, so there's likely to be a big slowdown in the economy," Raoul Ruparel, a director of Open Europe, told CNN. Greek GDP is expected to shrink by 2.3% this year and by 1.3% next year. Unemployment stands at 25%, and real wages are declining.